$10 (over 400 minutes) of Skype Credit lets you take advantage of Skype’s great features that cost a little, from calling mobiles and landlines worldwide, to getting online at over 1 million WiFi hotspots and only paying for the time you’re online. 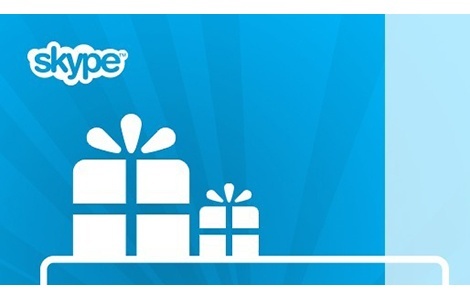 Even use your credit to buy a subscription and reach loved ones at Skype’s lowest call rates. Isn’t it time you gave yourself (or a lucky someone) some credit? *Over 400 minutes of calling based on a rate of $0.023 per minute. A small connection fee applies for each call. Call prices are subject to change. Calls are charged in one-minute equivalent increments. Any partial minute over 5 seconds is rounded up to the next full minute. Visit skype.com for call price details. Use of this digital code constitutes acceptance of the following terms: Digital code can be used to purchase Skype products and available items at skype.com. Broadband connection and Skype account required for redemption. Skype's terms of service at skype.com/tos apply. Terms can change without notice at any time. Digital code’s value is in US dollars. Digital code does not expire. No cash redemption, except where required by law. Protect this digital code like cash. Issuer is not responsible for lost or stolen digital codes or any unauthorized code use. Issuer will not replace or refund lost or stolen digitally issued codes. Visit skype.com for balance information and other digital code related inquiries. Digital codes cannot be used for emergency calls. Skype is not a telephone replacement service.